The Holy Week of last year, Niño, our officemate, invited us to join him in his annual pilgrim to the top of Mount Maculot. Mt. 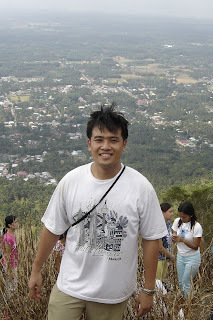 Maculot is a mountain that rises at town of Cuenca in Batangas province for pilgrims every Holy Week. The mountain rises at the southern banks of the Taal Lake and is about 2 hours drive south of Manila. And so, we join him in this hiking trip to its summit. It was my wife Jen and myself’s first time to hike a mountain but we tried to prepare for the trip. We were yet to be overwhelmed by the actual climb. We both wore shorts and shirts, plus rubber shoes and brought up some chips and water and our tents as we are going to stay overnight at the camp site on top. Posted in Asia, Batangas, Philippines, pilgrimage, trekking. Tagged camping site, Cuenca, Holy Week, mountain, Mt. Maculot, pilgrimage site, Taal Lake.